Make Laura Heine's adorable bunny. Learn to free motion quilt. Using Marti's Log Cabin Ruler create this wonderful quilt. Large zipper top bag for all of your magic stuff! There are 2 pockets on the outside and 2 pockets on the inside to keep everything organized. Structural stays keep it in shape. Quilting Ruler techniques as applied to the home sewing machine. Must have the required foot and rulers, call the shop. Back by popular demand, Joan will guide you through making this beautiful semi-fitted jacket with raglan sleeves and a zippered closure. A monthly gathering of English Paper Piecing. 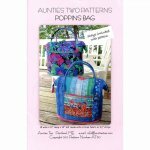 Bring any EPP project to work on with fellow Quilters.